In this paper, the concept of demand shaping is extended beyond the idea of demand manipulation that is commonly accepted. 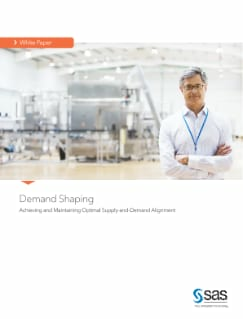 This broader definition of demand shaping requires the application of multiple technology sets to understand both supply dynamics and demand dynamics. Combining the analysis of supply and demand yields a much more complete answer to the issue of their alignment. The ability to quickly identify a misalignment and rapidly develop a remedial response is crucial to the organization's profitability. Therefore, an organization that develops a demand-shaping competency will have a significant competitive advantage. The core of any attempt to support demand shaping is the set of analytical engines that allow the supply-and-demand dynamics to be explored. The interaction between supply and demand in real-world supply chain systems is complex. This complexity must be modeled using the tools and techniques of mathematics and statistics. Only then can the optimal supply/demand alignment be achieved and maintained. This paper presents two methods that will provide organizations with the ability to exercise a more complete approach to demand shaping: scenario analysis and price/revenue optimization. In addition, a technical architecture is presented that demonstrates how to incorporate data acquisition and preparation, advanced analytical techniques, and presentation and reporting of results to achieve optimal supply-and-demand alignment.